← Traditional Homes Loves Ceilings Too! We’ve already toured the basement and the main floor now it’s time to travel to the third and final floor in our virtual home tour. 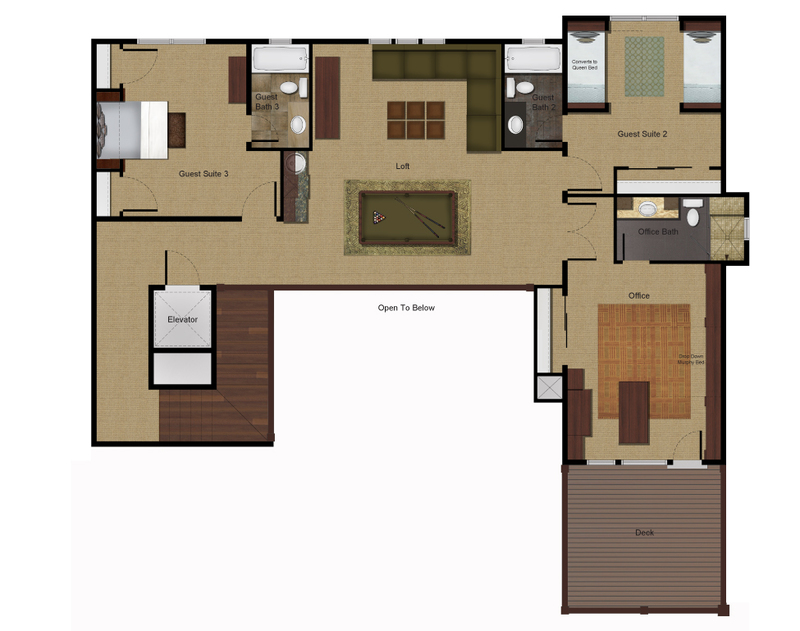 The upper floor features two guest suites, a tv/game room, and a home office. 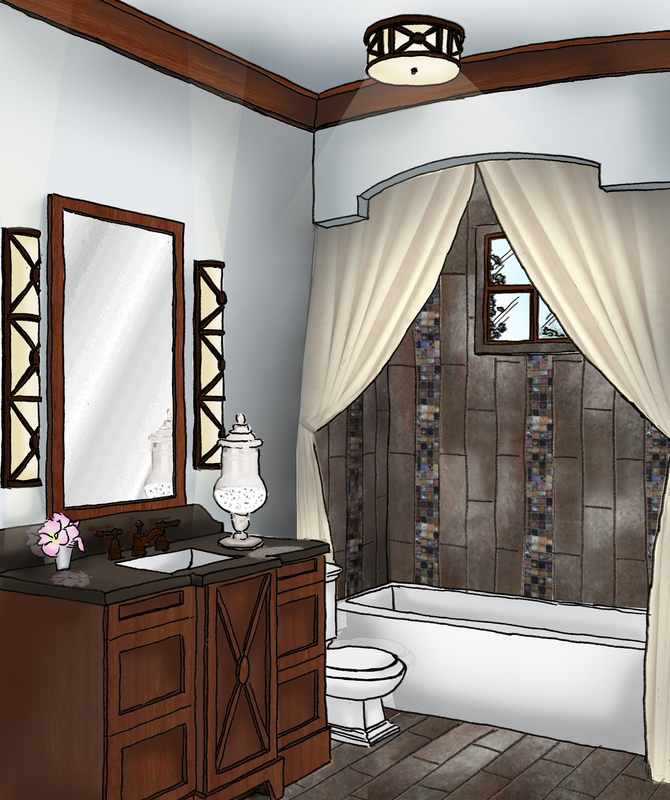 Here’s the first guest suite as you come of the stairs. Originally the entry to the room was on the other side of the room and the closet was on the same wall as the wet bar. Pam switched it up because the side of a bed isn’t the most welcoming view as you enter a room (and she’s not a big fan of doors as the focal point of a long hallway). The new arrangement created a dramatic focal point and provided even more storage than the original layout. 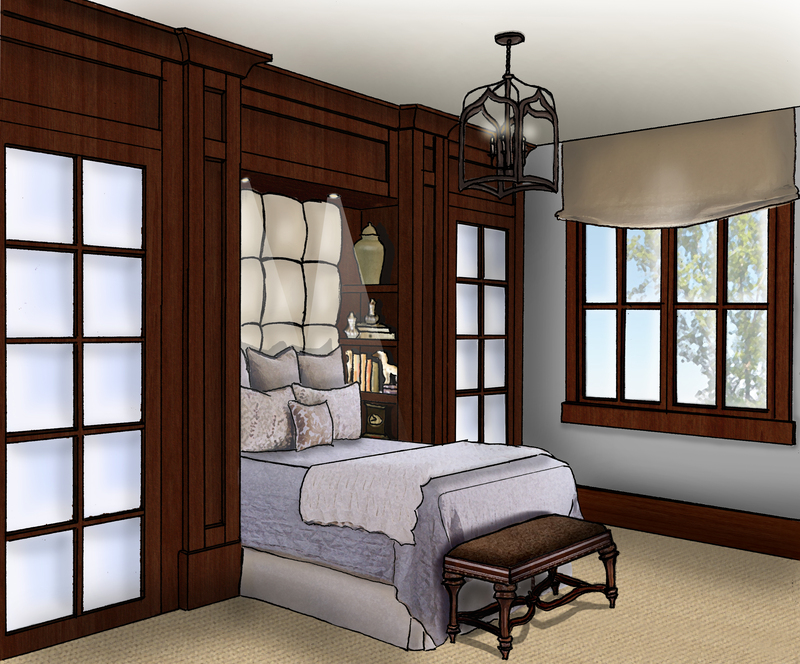 The bed is flanked with closets with frosted glass doors and framed with columns that conceal shelving. In the adjoining bath, we decided to use a standard tub with tall dramatic shower curtains on a curved rod (for more space in the shower) which was concealed behind a soffit to help soften the room (and to save money by not using glass. 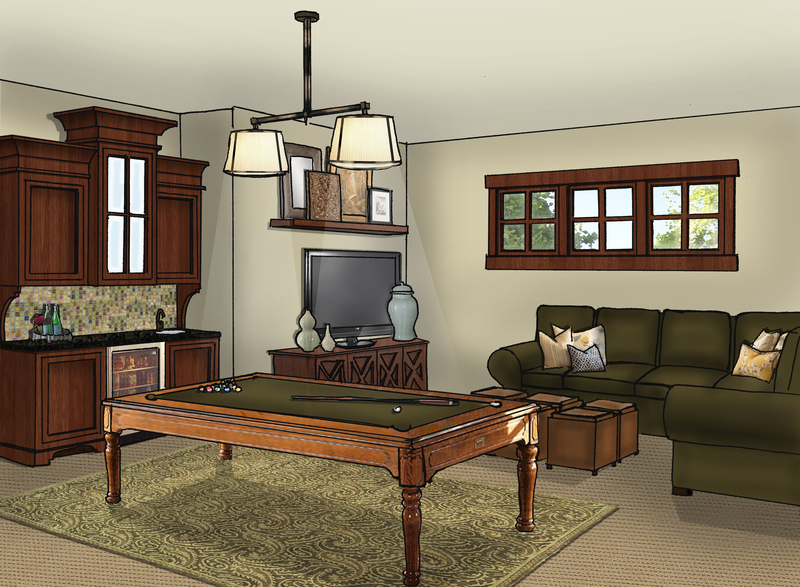 A TV/billiard room is nestled between the guest suites. He wanted it to be a fun place to watch TV and play games. It was also important to him to have a billiard table near his office so we made room for it here rather than in the game room in the basement. 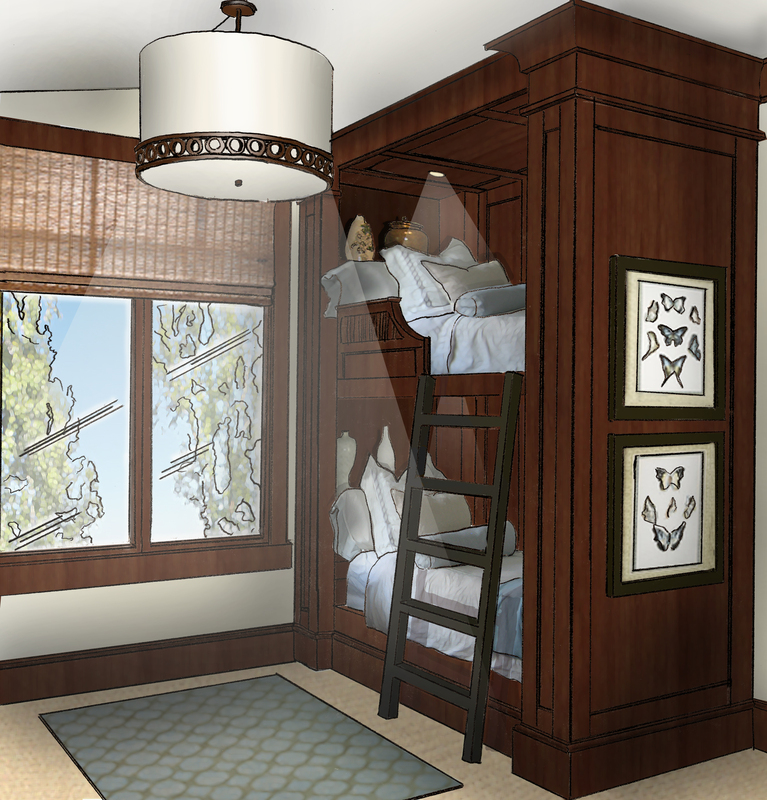 Because this is a vacation home Pam felt a room with bunk beds was necessary to maximize space. Two custom built-in beds takes bunk beds to the next level. 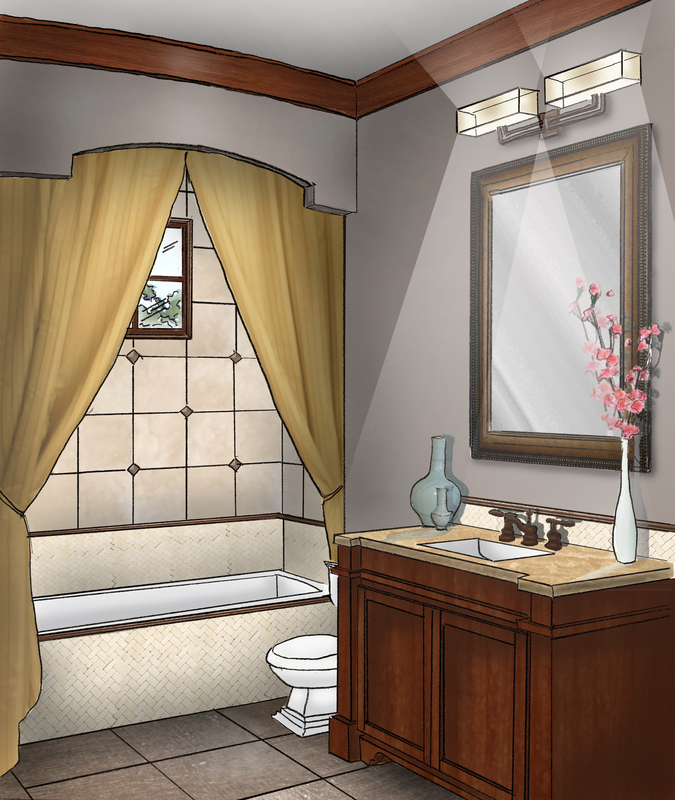 The adjoining bath is a bit more playful without being childish since several families would be using the space it was important to appeal to widest range of people. And finally we come to the office. Cherry cabinets and finish work paired with leather ceiling panels create a masculine atmosphere. A Murphy beds turns this space into a fourth guest suite if needed. 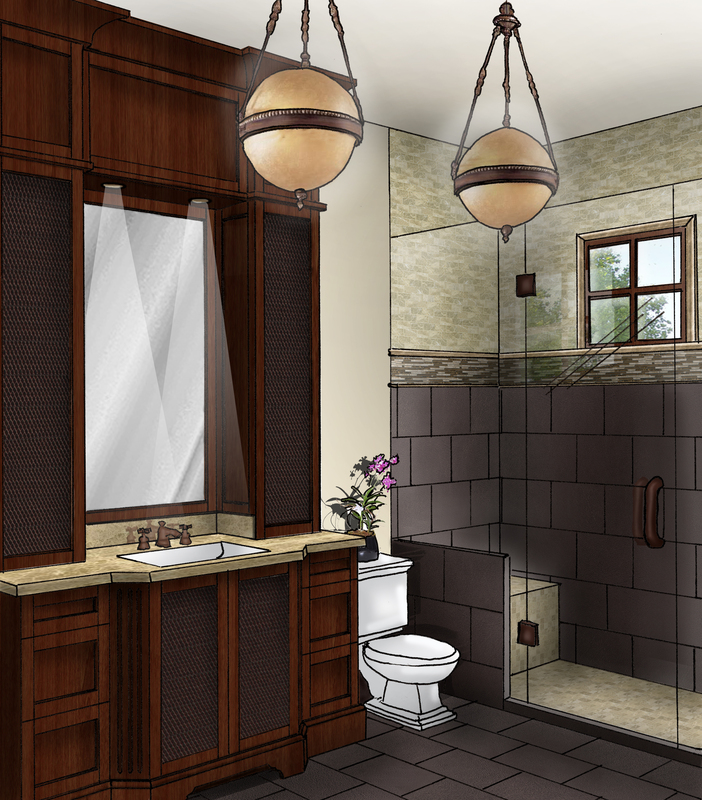 The masculine feel was carried through the ensuite bath. We have now come to the end of the tour. I hope you enjoyed it! I love the big upholstered headboard in the first guest bedroom. And I love how the bed is flanked by the built-ins — I think it makes the bed cozier. Thanks for telling me your rendering process. It sounds pretty involved, but the results are absolutely fantastic! !